These beautiful Sapphires are all clean, bright, natural stones and have just arrived from Sri Lanka. Hand selected straight from the mine and precisely cut but an incredible craftsman. 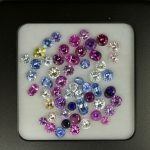 Just the most beautiful sapphires and all are in our store now. Come in and see the amazing colours to appreciate the clarity and cut.